DVD: Standard 1.33:1; audio English Dolby Digital 5.1 & Dolby Surround 2.0; English, French, Spanish subtitles; closed-captioned; single sided - double layered; 19 chapters; not rated; 58 minutes; $19.98; 10/2/01. Supplements: Audio Commentary From Actor Robert Englund; “Legends of the Boogeymen” Character Bios and Histories; Flixfacts Animated Trivia; “Name That Frame” Game; Theatrical Trailers; DVD-ROM Materials. I suppose the concept seems sound. For Boogeymen, we find a 58-minute compilation of snippets that spotlight famous killers from 17 different horror flicks. These range from 1960’s Psycho to 1997’s I Know What You Did Last Summer. For each flick, the program gives us a few introductory notes about the nasties in question and then launches into film footage, all of which gets pretty graphic. While the idea of Boogeymen appears sensible, in reality the program’s something of a dud. This happened for a couple of reasons. For one, while many of the killers found are justifiably classified as legends of the genre, most of them are pretty obscure. Sure, we get Norman Bates, Jason from the Friday the 13th movies, Freddy Krueger from the A Nightmare On Elm Street franchise, Halloween’s Michael Myers, and Leatherface from The Texas Chainsaw Massacre. However, the rest varied from the moderately well known (Pinhead of Hellraiser, Chucky of Child’s Play, the title character from Leprechaun) to the totally obscure (the title character from The Dentist and monsters from flicks like The Dentist and The Guardian). I wasn’t familiar with a lot of these personalities, and some of them seemed intriguing. For instance, The Ugly looked like an interesting flick, and I was surprised to find that The Guardian came from William Friedkin, director of The Exorcist and The French Connection; he’s not the filmmaker he was 30 years ago, but his presence makes me more willing to give it a look. Unfortunately, most of them seemed to deserve their obscurity. The brief film clips didn’t provide much reason to find them compelling or scary, and the characters failed to capture my attention. The vast majority of horror flicks are genuinely terrible, and little that I saw in Boogeymen convinced me otherwise. There simply aren’t enough truly memorable horror villains to fill a 58-minute program with interesting snippets. Actually, even if more terrific material existed, I still think the presentation of Boogeymen would fall flat. Within the appropriate context, these clips might work well, but as a running compilation, they lack the power and scariness that allowed them to succeed. No good horror flick would ever provide wall-to-wall gore, but that’s essentially what we get here. There are no opportunities for calm moments; it’s all tension and terror. This dilutes the impact the clips could provide, and they all start to blend into one after a little while. Compilation programs can be very entertaining, given the proper subjects. For example, a mix of musical pieces would be fun and winning, especially because there’s a potential ebb and flow there; different kinds of songs can alternate to make sure the show doesn’t feel too redundant. Unfortunately, all of the scenes in Boogeymen tend to feel a lot alike. They feature some tension - usually based on a spooky chase - and the violent killings; lather, rinse, repeat for 58 minutes. 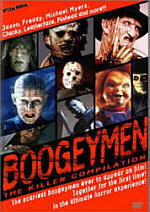 Between the repetitive format and the many uninspiring villains, Boogeymen never became very interesting. Boogeymen appeared in an aspect ratio of mainly 1.33:1 on this single-sided, single-layered DVD; due to those dimensions, the image has not been enhanced for 16X9 televisions. Some material used a 1.85:1 ratio, but these instances constituted only a minor portion of the program. As with most compilation pieces, Boogeymen featured erratic picture quality but for the most part, the image seemed to be fairly satisfying. Sharpness usually looked reasonably crisp and detailed. Some of the clips came across as mildly soft and fuzzy, but those varied from segment to segment, and none of them appeared significantly unfocused. Some moiré effects and jagged edges appeared, but I saw no problems related to edge enhancement. Print flaws also seemed to be surprisingly minor. Of course, these varied from movie to movie, but for the most part, grain was the main problem; many of the clips showed modest graininess. Otherwise, a mix of small problems cropped up, such as speckles and grit, but most of the films looked rather clean. Colors tended to be fairly drab, but that factor probably related mainly to the original cinematic designs. Most horror movies don’t feature bright, vivid hues, and these followed the usual pattern of dark and dank scenery. Throughout the subdued scenes, most of the tones looked reasonably clear but they remained pretty flat as a whole. The colors never stood out, but I didn’t feel that they caused any concerns. Similar variation related to the black levels and shadow detail. Blacks were never very dense and deep, but they also didn’t appear to be too flat or murky. Overall, I thought they lacked much intensity or depth, but they were acceptable for the most part. Shadow detail usually came across as decently heavy but not excessively opaque; the many low-light sequences failed to deliver great definition, but I found few true flaws. Probably my biggest complaint about Boogeymen related to its lack of original aspect ratio presentations. Of all 17 films, only A Nightmare On Elm Street and Psycho used letterboxed dimensions; all of the rest - including 2.35:1 flicks like Halloween and Scream - went fullscreen. This seemed odd and it diminished the potential impact of the scenes. Overall, Boogeymen provided a watchable but bland visual experience. Not surprisingly, the Dolby Digital 5.1 soundtrack of Boogeymen also offered a mixed bag, though it seemed to be reasonably satisfying. Soundfields varied based on the original material, from the monaural of Psycho to broader presentations for newer flicks. However, even recent movies like Scream and I Know What You Did Last Summer didn’t seem to offer very involving tracks. For the most part, the audio stayed pretty firmly anchored to the front channels. Some reasonably good stereo music appeared, and a mix of effects spread nicely across the forward speakers; these elements blended together well and moved fairly cleanly. However, most of the audio stayed stuck in the center, and the use of the surrounds seemed minor at best. Some general reinforcement of music and effects occurred, but I didn’t detect anything more substantial than that. Frankly, I got the impression that the original soundtracks had been “dumbed down” for some of these films. Granted, a lot of them were older works that probably never had strong audio, but I got the impression that the newer movies offered less powerful and substantial mixes. They weren’t totally uninvolving, but they seemed to be changed for a “lowest common denominator” presentation; they all appeared more similar than one would expect, which meant the better pieces lacked the strength they could have presented. Audio quality was moderately erratic but it sounded generally decent. Speech was generally a little thin and boomy, but most of the lines seemed acceptably natural and distinct, and I detected no concerns related to intelligibility. Effects showed some mildly excessive echo effects that made them sound a little artificial, but they usually were reasonably clear and accurate. Music showed fair dynamic range and clarity, and the low-end response demonstrated pretty good depth. Actually, the best moment in that regard came from Candyman; the title character’s voice boasted some fine bass elements. Ultimately, the soundtrack to Boogeymen offered a decent but unexceptional affair. Boogeymen tosses in a nice little mix of extras. Some of these can be accessed while you watch the movie itself. We find an audio commentary from Robert “Freddy Krueger” Englund, who provides a surprisingly interesting piece. Frankly, I expected little of this track. I thought Englund would add some good remarks during the Nightmare snippet, but otherwise I couldn’t imagine what he’d have to say about the movies in which he didn’t appear. However, the horror world seems to be a small one, so Englund knows and has worked with many of the others. He also appears to know a lot about the genre in general. As such, he was able to add a lot of interesting anecdotes and statements about the other boogeymen, and he also gave us his own thoughts about the characters. On a few occasions it was clear he read prepared notes - such as during Psycho - but most of this interesting and informative track appeared to be reasonably off the cuff. All in all, Englund offered a fun and fairly compelling piece. Another extra that accompanies the film is the Flixfacts Animated Trivia. With this option activated, the program provides a text commentary along the bottom of the screen. A nice variety of general facts come from this area. Few are revelatory, but most seem interesting and useful. Some of them repeat what Englund says, but it’s still a good way to learn a little more about the characters and their films. Legends of the Boogeymen offers biographies for 11 of the maniacs seen in the film. Each one consists of two screens worth of pretty good info about the different characters. I’m not sure why the other six “boogeymen” were omitted, but these notes seemed solid. Next we find the Name That Frame game. This provides a random image from one of 10 movies, and you need to identify it. As far as I can tell, there’s no reward for success; the games appears to continue forever no matter how well - or poorly - you do. A slew of Theatrical Trailers appear on the DVD. We find clips for Hellraiser, Wishmaster, The Texas Chainsaw Massacre, Leprechaun, Child’s Play 2, Candyman, The Guardian, The Ugly, The Dentist, Phantasm, The Puppet Master, and Halloween. Additional ads appear in the “FlixMix Recommends” section. In addition to a text listing of two upcoming FlixMix titles, we find trailers for Universal films Jurassic Park III, American Pie 2, and The Mummy Returns. Finally, Boogeymen tosses in some DVD-ROM materials. A “Trivia Game” features two levels of 10 questions each. You have to get at least eight correct in the initial level to move to the second, and another score of at least 80 percent provides a small reward: a brief QuickTime clip in which Robert Englund relates his top five boogeymen. In addition, the DVD-ROM area includes links to the websites for Boogeymen and Flixmix.com as well as a “Sound Effects” feature. This lets you mix together horror film noises like pealing bells and screams. While I kind of like the idea, Boogeymen comes across as a fairly monotonous piece. It combines kill after kill for a compilation of gore that rarely seems very compelling. The DVD provides acceptable but erratic picture and sound with a few decent extras. Dedicated horror fans might want to give Boogeymen a look, but others probably will not much care for it.